Victor watched his master getting into the car, observed his five-fingered hands about this daily task. Twisting keys in the lock. Lifting the handle. Spreading for balance as he leant across the seat. Flicking delicately across the buttons of the stereo, and tapping a rhythm to echo the music. Finally they gripped the wheel as the black Mercedes crunched off down the gravel drive. Victor looked down at his own hands. Two wide, metal digits faced each other across a motorised palm, padded in case he clenched too tight. A hand to grip and prod. Open and closed, nothing more. A binary hand for a servant of silicon and tin. Victor rolled into the kitchen, rubber tracks silent on the polished floor. He carried plates and mugs to the dishwasher, gripping and releasing each in turn, then prodded a button. As the machine rattled mindlessly into action Victor fetched the vacuum from a cupboard, pressing the on switch and gripping the nozzle as he dragged it round the floor, chasing down dust. Later he carried his mistress’s shopping in from the car, a long succession of plastic bags gripped and released safely back in the house. Left alone in the late afternoon, he went to the breakfast table and reached out toward a slender vase of roses. Twin fingers spread wide, then closed gently round the bottom of the vase. Lift, and turn so slightly, holding the delicate tube up to the light as he had seen his master do. The vase swung down between his two flat fingers, petals and water cascading across the table. At night, Victor plugged into the security system, overseeing the house through its hidden cameras. In the bedroom his master and mistress slept with hands entwined, fingers meshed. The master enjoyed coin tricks. 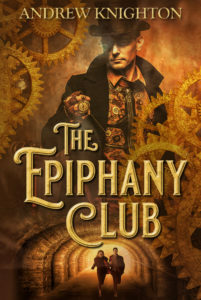 Victor replayed a memory, watching a circle of copper dance across those hands, fingers twitching and turning, making the metal flit back and forth, dart into the air, and disappear, only to reappear between two outstretched digits. Five such delicate, flexible instruments – what joy to be human. Victor wanted to see the fingers up close. He unplugged himself from the security net and quietly rolled down the corridor. Gripping the handle, he pushed open the bedroom door and approached the humans as they slept. His mistress turned in the moonlight, fingers stretching out and running through the sheets, pulling them tight. Victor leaned forward, reaching out, trying to sense what each finger was doing, how such a marvel worked. The master shifted, disturbed by the mistress’s movement. Eyes opened slightly, then widened, staring up at Victor with an expression the robot had never seen before. After de-bugging, Victor was sold to a shop. He gripped and released, fetching and carrying all day. When the till opened, he would turn away, unable to look at the change being counted, unable to understand why. This story was previously published in issue 17 of Carillon and issue 20 of Flash Me Magazine. I’ve just had a story, Holy Water, accepted for the first issue of a new magazine, Alt Hist. Not sure when it’s out yet – will post details nearer the time. I’m really pleased with this sale. Of course I’m really pleased any time I place a story, but as someone who spent six years studying history and now spends their spare time writing fantasy, it’s great to find an outlet that combines the two. I often draw on my historical knowledge for stories, and this can lead to things that aren’t quite fantastical enough for most magazines, but which aren’t quite historically focussed enough to get into the very small number of magazines for historical fiction. So if someone had said to me ‘what magazine would you like to exist?’, I’d have described something a lot like Alt Hist. And now it’s there, and I’m in it from the start. I’d call that a win. Yet again, I have two flash fiction stories in the latest issue of Alienskin. Both fantasy pieces this time. The Essence of Man is about the power of art. I’ve used a Renaissance-style setting, plundering the era that saw the emergence of the artist as a celebrated individual, and a humanism that justified beautiful art and horrific politics. Da Vinci and Machiavelli have more in common than place and time. There’s a unifying assumption of man’s importance that we now take for granted, but was once radical. The other story is The Suspicions of Shadowvalt, a demonic detective story. A thousand words isn’t much space for a mystery, investigation and resolution. I enjoyed the challenge, but will leave it to you to judge the results. This is the last edition of Alienskin. It’s a shame. They’ve published a lot of good little stories, even if their clip-art aesthetic sometimes set my teeth on edge. But eight years is a long to dedicate to something like that, especially when it’s just your hobby. Here’s hoping that the editors go on to even better things. Dragged into daylight on crankshafts and giant fanbelts comes Urban Drift, my latest published story, appearing in issue 56 of the British Fantasy Society’s journal Dark Horizons. It’s steampunk in the tradition of alternative technological futures, not the airship Victoriana style. It’s a heist story about art, beauty and addiction. It’s a chase to the rhythm of giant gearwheels and crackling tezlas. It’s fragments of the folk myths of industrial Britain, pounded to a fine grit and scattered over something more American. And it’s inspired by the very real fact that they used to move entire buildings in nineteenth century Chicago. One of the first stories I had published, The Cast-Iron Kid, is going to be reprinted in October in Ann and Jeff VanderMeer’s splendid looking Steampunk II anthology. The whole book looks awesome, from the picture of a mechanical ostrich to the obscure 19th century Danish story in translation for the first time. My story’s a steam western, one of two I’ve had published in Alienskin. The world should have more steam westerns. The tension of frontier existence, the lawlessness, idealism and ambition that flourish in that environment, are great drivers for a story. So much steampunk is rooted in the civilised centre of society, but it’s a genre about people pushing the boundaries of their technology. Combining that with those racing towards the boundaries of society, to me that’s a perfect fit.